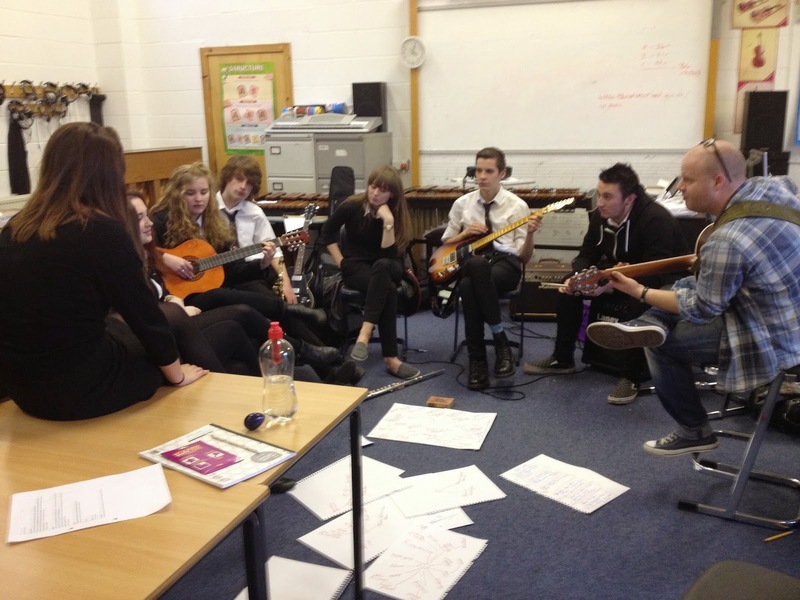 How to write a song with 8 music pupils, 2 songwriters and approximately 4 hours. Some get up and Go! I know you think I'm joking but I'm actually not. The session was planned with timings and the stimuli were designed to get people thinking, but the session also had to be organic. It followed the interests of the pupils and how they related to their own family background and history. 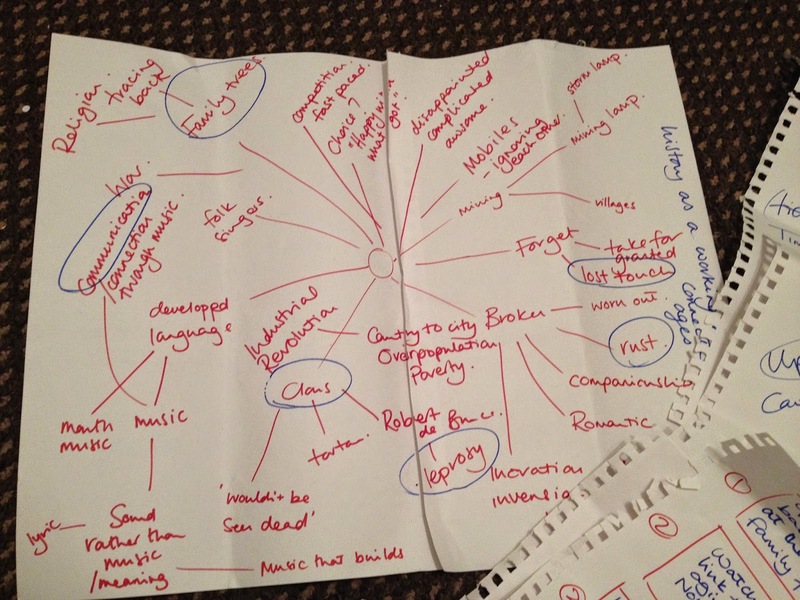 We made the mind map below of what themes inspired and how they linked together. 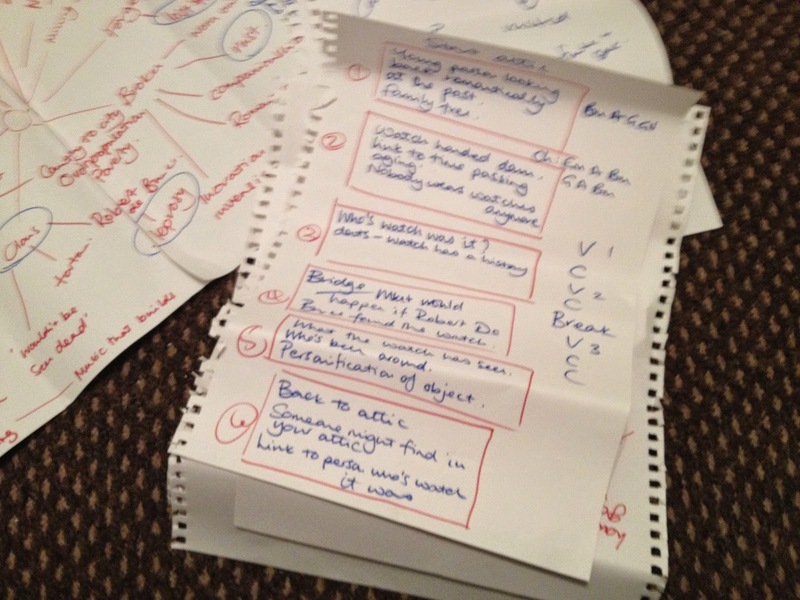 From there we did 'box' diagrams of how we wanted the song to progress - a bit like a storyboard. It's not a method I've used, but Davey has used it with groups in the past and it helped us to track our direction and where we were up to in the song. One of the pupils was a regular songwriter and had a chord structure waiting to be used that the group all liked - this was the verse chord structure and went well with the mood that we wanted. There was somewhat of a pause from the group when it came to beginning the lyrics. Nobody quite wanted to, or knew how to start us off. So I proffered the following line - 'high up in the eaves of the house...' This tied in with our beginning point of a person going through their grandparents loft and finding possessions that gave some insight into their life. From here the lyrics began to flow - I guess its similar to authors being given an opening line and then taking the story in any chosen direction. We only needed to occasionally interject a line or a rhyming word and the song would continue to flow. Lyrics are what I love - Davey was the music maestro and offered the chords to the chorus and was brilliant at arranging the song ready for performance. Whilst you would never really break a song up into 'who did what' (that can break a good band!) 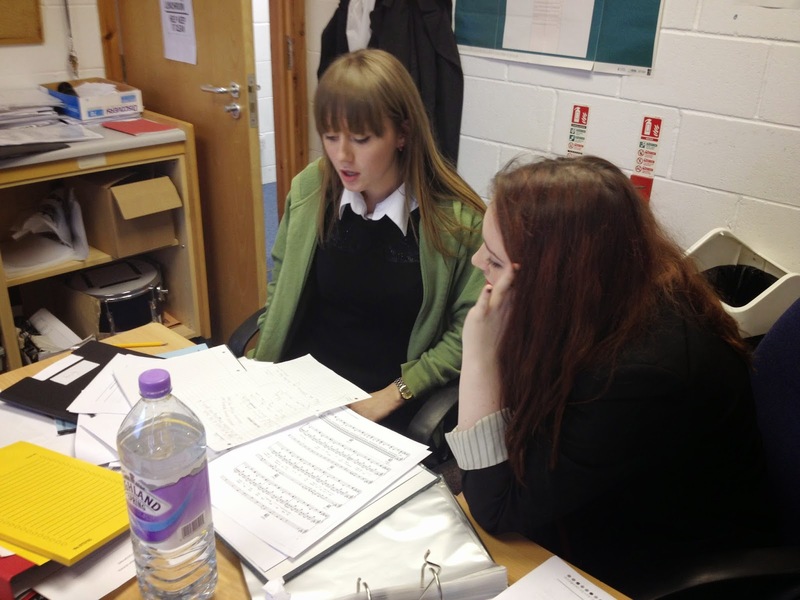 I've done so below just to show how much of the song did indeed come from the pupils themselves. The turquoise is theirs and the yellow and pink show where me and David stuck our noses in to keep things flowing. I think you'll agree that this was pretty amazing for 10 people working together on a project, most of whom had never written a song before. I thoroughly enjoyed the day and have started to think about music workshops and community music as a possible way forward for me. I hope you enjoy the song and a bit of the insight and well done to those amazing pupils! Don’t you feel the, don’t you feel the change. Time ticks by stuck in the past. Time ticks by and I remain. Singing up a Storm! - Pits, Ponies, People and Stories. The Pits, Ponies, People and Stories project came about after pupils from previously coal mining communities were found not to know firstly, what coal is and secondly, that their town had a deep history in the industry. The project aims to reawaken our awareness of local history and how our own lives link to the past. My task this week was to run a songwriting workshop (with the brilliant David Roddie of UWS), in collaboration with Pits, Ponies, People and Stories, that encouraged young people to relate to their history in a meaningful way. So with 8 pupils who have chosen to study music, David and I asked the question: 'How do our lives link to the past?' with the added requirement, lets write a song about it! I wanted to call this post 'so anyone an write a song', but that would belie how amazing the students at Stonelaw High School were and how fully they engaged with the task. 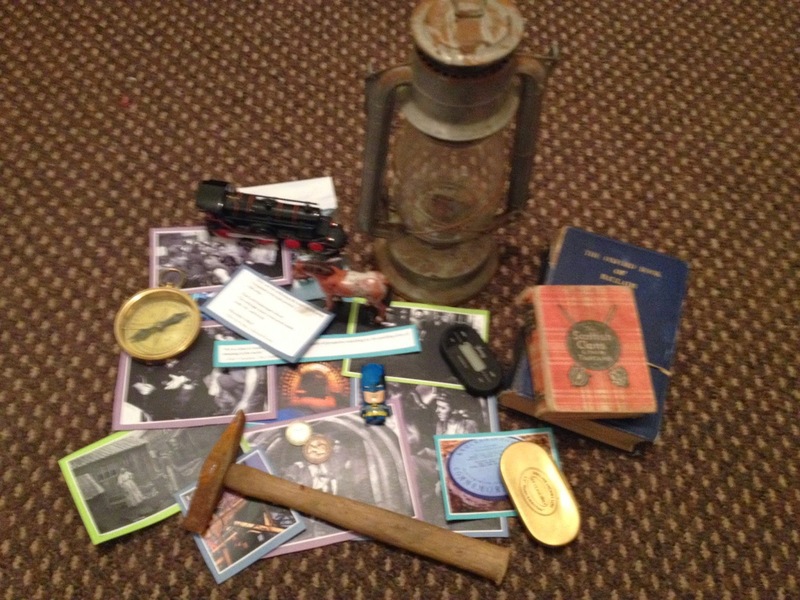 We used various stimuli to spark ideas within the workshop: old money, toy ponies & trains, a hurricane lamp, a compass. We contrasted these with some modern day items to find out: What does the past mean to you? They had lots to say in response. 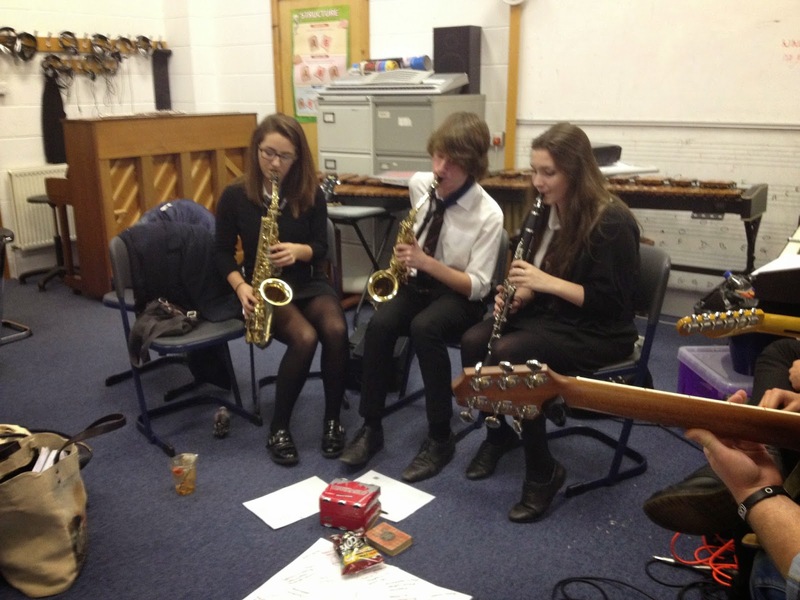 The pupils involved in this songwriting project are (alphabetically): Sean Dempster (drums); Hazel Douglas (voice); Andrew Friel (electric guitar); Alistair Grant (sax); Heather McMillan (clarinet); Daisy Miles (acoustic guitar); Sophie O'Mailley (sax) and Eilidh Smith (voice). And we were hosted by J.Swan their talented music teacher (thank you). From what the students said, two of them had written songs in the past and a number of them were in self formed bands. With the amount of motivation and effort they put into this workshop, I hope that they go on to write further songs. I thoroughly enjoyed the day (and working with Davey - thank you). It is quite possible that there are 8 more songwriters in the world, so watch this space! I've always been fascinated by nursery rhymes and the half truths we tell to children. I was brought up on Tim Hart's nursery rhyme renditions. These were two children's records made by top notch folkies of the time to save their own ears from the dire children's recordings that they were expected to inflict on their offspring. I loved these records. We had my dad's old record player in the play room and these were the only two records we ever played. I still have a vivid image of the front sleeve of 'What shall we do with the drunken sailor' - a girl in a bright yellow sequinned dress supporting a drunk sailor in a stripey top. There were also years of my dad complaining that we had either lost or scratched this record until both were thankfully released on CD recently. In contrast to these were the children's records of Roy Bailey. Songs such as 'you need skin' sat happily alongside 'swallow swallow' which explained beautifully the migration of birds to warmer climates in the winter. I watched Roy Bailey at the Skegness folk festival when I was 6. I asked him if he'd play 'swallow swallow', but he smiled kindly and said that he couldn't remember the words. Then a few years back I went to see Roy Bailey with Tony Benn and heard for the first time his political songs. But Roy Bailey in my view didn't ever glamourise in his children's songs to the point of telling untruths. His lines included 'some women love women, some men love men', 'the vitamin dance' and a fab poem about how frustrating it is to be small. I always felt that Roy Bailey's songs gave children a truth that they deserved. I have worked with children of varying ages for the past 11 years and have sung nursery rhymes on a daily basis for many of these jobs. I've been struck by how many nursery rhymes have lost meanings or are simply very difficult to understand. There are plenty of books on the subject, but during our collaborative songwriting week, I used the idea of untruths in nursery rhymes to write 'Lavender's Hue'. This is a song about disillusionment and the impact of half truths on adults - although the theme we were given was 'the night' and to write within AABA/ 32 bar form. I was pounced upon by a film crew whilst writing this song and below is their very well crafted documentary which they have titled 'Queen of Truth'. I hope that you enjoy both the film and the song, and thanks for all their hard work.